Pick Your Platform, Keep Your Save! With the launch of Diablo® III: Reaper of Souls™ - Ultimate Evil Edition™ just around the corner, many of you are probably wondering what to do with your characters from the original game—especially if you've adopted a next-generation console. Well, wonder no more. As of today, "cross-brand" and "cross-generational" transfers have been enabled for Diablo III on supported PlayStation® and Xbox® platforms. These transfers will allow players to export their save data from Diablo III on the PS3™ and Xbox 360™ and import it to Ultimate Evil Edition on the PS4™ or Xbox One™. 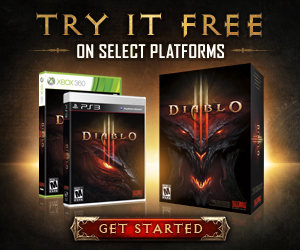 Played Diablo III on the PS3, but want to pick up and slay with Ultimate Evil Edition on the Xbox One? No problem! Previously mowed down some demons on the Xbox 360, but are now looking to cull hordes of renegade angels on the PS4? We've got you covered. The process of transferring your saved data is simple, and we've included a step-by-step guide below to get you started. If you will be playing Ultimate Evil Edition on the same console on which you are currently playing Diablo III, follow the steps below to transfer your data. Step 1: Insert your Ultimate Evil Edition disc or launch the digital version of the game. If you will be playing Ultimate Evil Edition on a different console (same brand, different generation), follow the steps below to transfer your data. Step 1: Insert your original Diablo III disc or launch the digital version of the game. Step 2: Download and install patch 1.0.3 for Diablo III. Step 3: Log in to your Sony Entertainment Network (SEN) or Xbox Live (XBL) account. Step 4: Proceed to the main menu. Navigate to "More" > "Export Save." Step 5: Confirm this selection and proceed through any prompts that appear. Success! You've exported your save data. Step 1: Log in to the same SEN or XBLaccount from which you exported your save. Step 2: Insert your Ultimate Evil Edition disc or launch the digital version of the game. Success! The game will now automatically check our servers for exported save data and load it on your new platform. Step 2: Log in to your Sony Entertainment Network or Xbox Live account. Step 3: Proceed to the main menu. Navigate to "More" > "Export Save." Step 4: Confirm this selection and proceed through any prompts that appear. As of April 26, 2016, this feature is no longer available. Please see this blog for more information. Q. What types of cross-brand and cross-generation transfers are supported for Ultimate Evil Edition? The goal of cross-brand/cross-generational transfers is to support players who may have switched brands when next-gen systems were released for PlayStation and Xbox, but don't want to leave their progress from original Diablo III behind when upgrading to the Ultimate Evil Edition. Saved data will be automatically loaded after installation of same-platform upgrades to Ultimate Evil Edition (PS3 > PS3 and Xbox 360 > Xbox 360). Q. Will I be able to transfer my game data from PC to console for Ultimate Evil Edition? No. You will not be able to transfer your game data from PC to any supported console platform for Ultimate Evil Edition (or vice-versa). Q. What data will transfer? Your hero, item, and game progress data will all transfer. Q. Will my pre-order bonuses from original Diablo III transfer? Yes. Your pre-order bonuses from original Diablo III will transfer to Ultimate Evil Edition, but only if you’re moving to the same brand (i.e. PS3 > PS4 or Xbox 360 > Xbox One). Once these bonuses are transferred, new heroes on your account will also receive them upon creation. Pre-order bonuses from original D3 will not transfer if you’re moving to a different brand (i.e. PS3 > Xbox One, Xbox 360 > PS4). Q. Will my Sony-exclusive content from original Diablo III transfer? Yes, but only if you’re moving from PS3 to PS4. If you move from PS3 to Xbox One, please note that you will permanently lose access to all Sony-exclusive content on your account. Q. Will my Achievements and Trophies transfer from Diablo III to Ultimate Evil Edition? No. Each version of Diablo III and Diablo III Ultimate Evil Edition has its own set of Achievements and Trophies. When you upgrade from Diablo III to the Ultimate Evil Edition, you will find a whole new set of achievements and trophies to unlock. Q. What if I no longer have access to my original Diablo III disc and/or current-gen platform? If you no longer have access to your original Diablo III disc and/or current-gen platform, don't worry—you may still be able to transfer your save data to another brand or platform generation for Ultimate Evil Edition. You’ll need your save file (available via cloud storage, USB, hard drive, or memory unit), any current-gen Diablo III disc or a digital version of the game, and access to a current-gen platform (as with the disc, the platform doesn’t need to be yours). From there, follow these quick steps. Step 1: Insert the original Diablo III disc or launch the digital version of the game. Step 2: Ensure that you are connected to the Internet. Step 3: Download and install patch 1.0.3 for Diablo III onto the system. Step 4: Log in to your Sony Entertainment Network or Xbox Live account. Step 5: Import your saved data as normal (Xbox 360, PS3). Step 6: Depending on what kind of transfer you’re looking to process at this point, refer to the appropriate category below for instructions on how to export and import saves from Diablo III to Ultimate Evil Edition. Q. If I play Ultimate Evil Edition on PS3 or Xbox 360, will I be able to transfer my save file to PS4 or Xbox One? Yes. The PS3 and Xbox 360 versions of Ultimate Evil Edition will have an Export Save option for players who wish to transfer their progress to PS4 or Xbox One at a later date. In order to use this option, though, you will need to first purchase Ultimate Evil Edition on the corresponding next-generation platform. Q. Will I be able to transfer my save file from PS4 and Xbox One to PS3 and Xbox 360? No. You may only transfer your saves forward (i.e. from current-gen to next-gen platforms), not backwards (i.e. from next-gen to current-gen platforms). Q. Are there any rewards for linking my PlayStation Network and/or Xbox Live account with my Battle.net account? Yes! Players who link their Sony Entertainment Network and/or Xbox Live accounts with their Battle.net account will receive an exclusive reward, the Signet Ring of the Blizzard. The Signet Ring of the Blizzard is a level 11 Legendary ring that will provide your characters with a nice damage bonus as well as a chance to freeze enemies on hit. Thanks to the guaranteed “Level Reduced by 10” affix, the ring can be worn immediately by new heroes. Q. I don’t have a Sony Entertainment Network account and an Xbox Live account. Will I have to link both to my Battle.net account in order to get the Signet Ring of the Blizzard? No. You only need to link one account (Sony Entertainment Network or Xbox Live) with your Battle.net account in order to qualify for the Signet Ring of the Blizzard. If you have an SEN account and an XBL account, but only choose to link one, the account which you link with Battle.net will be the one on which you receive the ring. Q. Will the Signet Ring of the Blizzard transfer cross-brand and/or cross-generation? Yes, the Signet Ring of the Blizzard will transfer with you and will be available to new heroes created on your account after you’ve moved across brands or platform generations. It's never been easier to jump back into the game and continue leveling your characters as you explore the Ultimate Evil Edition. What epic loot will you find, and what builds will you create? There's only one way to find out. We'll see you in Westmarch, nephalem!